A stunning custom made 14kt. 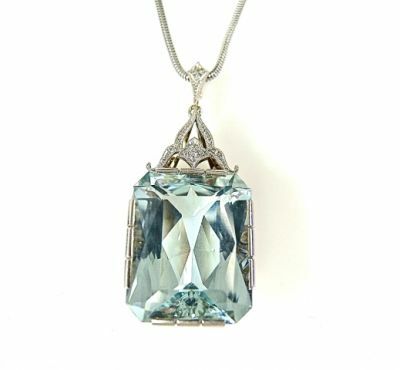 white gold pendant with chain, featuring 1 claw set emerald cut light intense blue aquamarine, est. 52.87ct. ; 5 bead set rose cut diamonds, est. 0.02ct. (clarity: VS-SI & G-H colour) and 1 bead set old European cut diamond, est. 0.08ct. (clarity: VS & G-H colour). The snake chain is approx. 17.75 (17 3/4) inches or 45.09cm long.